1. Which of the following implies the significant advantage of a public limited company over a proprietorship firm? 2. Which of the following players cannot act as a borrower in the call money market? 3. 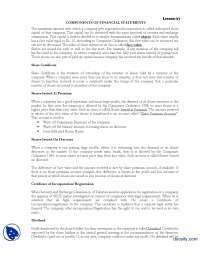 Which of the following statements represents the financing decision of a company? 4. Which of the following is not a feature of certificate of deposit issued by a bank? 5. Which of the following is a sterling denominated foreign bond raised in the United Kingdom domestic securities market? 6. Which of the following instruments in the international capital market are fixed-interest securities having a maturity of over one year? (a) The lender (b) The borrower (c) The Reserve Bank of India as the amount involved is huge (d) Negotiation between lender and borrower (e) Both lender and borrower but within the maximum limit prescribed by RBI. 8. M/s. Pee & Cee Ltd., has received the third highest credit rating for its issue of commercial paper. If its fund based working capital limit is Rs.3 crores, and assuming other requirements are met then which of the following is true? 10. Which of the following situations leads to the increase in volatility in the call money market? earnings of the company to grow at a constant rate and the pay-out ratio to remain constant. 13. Vision Ltd., a Non-Banking Financial Company (NBFC) offers car loans with two different schemes. Scheme A offers 10% discount on down payment of cash. Scheme B asks for a down payment of Rs. 18,000 and a monthly payment of Rs. 4,100 for 5 years. represents the present value of cash inflows of both the schemes? (a) Rs.2,50,000; Rs.2,17,000 (b) Rs.2,25,000; Rs.2,17,000 (c) Rs.2,25,000; Rs.2,17,182 (d) Rs.2,25,000; Rs.2,18,582 (e) Rs.2,35,000; Rs.2,18,500. 16. Which of the following is/are true regarding the capital recovery factor? specified period at a given rate of interest. 18. Which of the following statements is/are true with respect to portfolio risk? I. The diversifying effect of each additional stock increases with an increase in the number of stocks in the portfolio. II. The higher the degree of positive correlation between the stocks, the greater is the amount of risk reduction that is possible. III. The portfolio risk will be minimum, if the stocks are perfectly negatively correlated. (a) Only (I) above (b) Only (II) above (c) Only (III) above (d) Both (I) and (II) above (e) Both (I) and (III) above. 19. 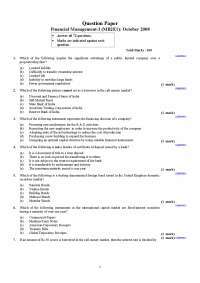 Which of the following is/are true regarding variability? deviation. III. Higher the variance, higher the standard deviation. 20. Which of the following relationships is represented by the characteristic regression line (CRL)? 22. The current purchase price of a security is Rs.50, the last dividend paid is Rs.2 and the growth rate is 7%. If the required rate of return on security according to CAPM is 10%, then what should be the increase/decrease in the price of the security such that it is at equilibrium? 23. An investor has purchased a security that has a beta of 0.6. The investor is expecting this security to provide a return of 12%. If the expected risk free rate is 6% and expected return on the market index is 14%, which of the following is/are true according to CAPM? I. The security falls above the SML. II. The security is overvalued. III. Alpha intercept is positive. IV. The security can be purchased. (a) 12.8% (b) 18.1% (c) 18.8% (d) 20.2% (e) 21.3%. 25. Stock A has a beta of 0.8 and Stock B has a beta of 1.2. 50 percent of Portfolio P is invested in Stock A and 50 percent is invested in Stock B. If the market risk premium were to increase but the risk-free rate remained constant, which of the following would occur? 26. Mr.Amit bought 100 equity shares of a company. After a year, he found that the ratio of the price of an equity share at the end of a 1-year period to its price at the beginning of the 1-year period is 5:4. 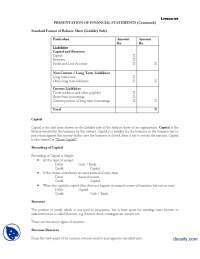 What is the capital gain yield from the equity share? 27. If the beta of a stock is equal to zero, which of the following statements is/are true according to CAPM? I. Slope of SML is zero. II. 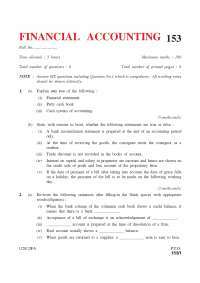 Required rate of return of the given stock is equal to the risk free rate of return. III. Stock will lie on the SML. 28. Which of the following statements is not true? 29. Which of the following is a key determinant of operating leverage? 30. Other things remaining the same, which of the following will increase the quantity produced at the operating break-even point? I. Decrease in the selling price per unit. II. Increase in the variable cost per unit. III. Decrease in the fixed costs of the firm. (a) Only (I) above (b) Only (II) above (c) Only (III) above (d) Both (I) and (II) above (e) Both (II) and (III) above. of the company consists of 3000 lakh equity shares of Rs.40 each. Further the company has employed preference share capital, which has a book value of Rs.550 crore, and the dividend rate on the same is 20%. It is expected that there will be no change in its capital structure in the near future. 34. Vipul Auto Ltd., is showing a lower dividend yield and higher price-earning ratio than Vijay Auto Ltd., If EPS, DPS and required rate of return of both the companies are same, then which of the following can be concluded? I. Price of Vipul is lower. II. There is considerable growth prospect in Vipul. III. The investors of Vipul can expect higher capital gains yield than the dividend yield. I. They are also referred to as PSU bonds. II. They are issued through auctions conducted by RBI. III. They cannot be rediscounted with RBI. (a) Only (I) above (b) Only (II) above (c) Both (I) and (II) above (d) Both (II) and (III) above (e) Both (I) and (III) above. 36. Which of the following bonds will have the greatest percentage increase in value if all interest rates decrease by 1 percent? 37. Which of the following is/are not true regarding the dividend ratios? 38. A zero-coupon bond that matures 5 years from today has a par value of Rs.2,500 and yield to maturity of 11.5% per annum, what is the current value of the issue? 39. Ajanta's stock is currently selling for Rs.11.44. This year the firm had earnings per share of Rs.2.80 and the current dividend is Rs.0.68. Earnings are expected to grow 7% a year in the foreseeable future. The risk-free rate is 10 percent and the expected market return is 14.2 percent. What will be the effect on the price of Ajanta’s stock if systematic risk of the stock increases by 40 percent, all other factors remaining constant? 40. Three bonds A, B and C with same coupon rate, par value and maturity have yields to maturity (YTMs) of 10%, 8%and 12% respectively. Then which of the following expressions is/are true regarding the value of bonds A, B and C? 41. Which of the following will lead to an increase in the expected Price-Earning ratio? I. Increase in the expected dividend payout ratio. II. Increase in the cost of equity capital. III. Increase in the growth rate. (a) Only (I) above (b) Only (II) above (c) Only (III) above (d) Both (I) and (III) above (e) Both (II) and (III) above. 42. Which of the following statements is not true with regard to valuation of bonds? 43. Which of the following is not true with regard to the multi period valuation model of equity shares? 44. Which of the following is/are true with regard to the convertible debentures? I. The conversion value is the minimum value of the convertible based on the current price of the issuer’s stock. II. In case of optionally convertible debentures, on the exercise of the option of conversion the holder of the instrument has to pay the issuer the specified amount. III. Conversion premium is the difference between the conversion price and the conversion value. 45. When the market is low, which of the following methods of raising capital are preferred? I. Initial public offer. II. Bought-out deal. III. Private placement. IV. Rights issue. 46. Who among the following players in the international capital markets collect the rupee dividends on the underlying shares and repatriate the same to the depository in US dollars/foreign equity? (a) It is a kind of non-convertible debenture with an attached warrant (b) It is convertible debenture with options (c) The warrants attached to the SPN gives the holder the right to apply for one preference share (d) It is partly convertible debenture with attached warrants (e) It is an example of participating preference shares. 48. Which of the following is a feature of preference shares? (a) Rs.1,10,00,000 (b) Rs.2,20,00,000 (c) Rs.3,30,00,000 (d) Rs.4,40,00,000 (e) Rs.5,50,00,000. (a) Rs.15,00,000 (b) Rs.20,00,000 (c) Rs.24,00,000 (d) Rs.25,00,000 (e) Rs.30,00,000. 60. The cost of which of the following sources of finance can be found out by the bond yield plus risk premium approach? 61. Which of the following is not a merit of using book values as weights for calculating the weighted average cost of capital? 63. Fast Foods posted a net income of Rs.15 million this year. Financial planners at Fast Foods anticipate to have a capital budget of approximately Rs.18 million. The firm also anticipates retaining its target capital structure of 60% equity and 40% debt. If the firm follows a strict residual dividend policy, what is their expected dividend payout ratio? 64. 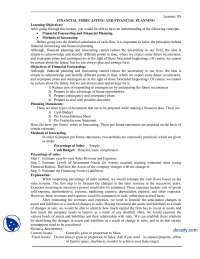 Which of the following statements is/are true with respect to bankruptcy costs? I. These costs represent certain restrictions on the firm in the form of some prospective covenants incorporated in the loan contract. II. These costs represent a loss, which can be easily diversified away. III. The probability of bankruptcy increases at an increasing rate as the debt-equity ratio increases. IV. Expected cost of bankruptcy increases as debt-equity ratio decreases. 66. Which of the following is/are the limitation(s) of Walter’s model? according to Walter’s model on dividend policy? 68. 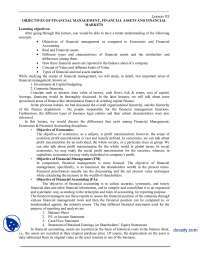 Which of the following statements is false regardingassumption made under the Modigliani and Miller approach for dividend policy of a firm? 69. Oswal Industries Ltd., has 80,000 shares outstanding. The current market price of each share is Rs.75. The company expects a net profit of Rs.12,00,000 during the year and it belongs to a risk class for which the approximate capitalization rate has been estimated to be 20%. The company is considering dividend of Rs.10 per share for the current year. According to the Modigliani and Miller model, how many new shares must the company issue if the dividend is paid and the company needs Rs.28,00,000 for an approved investment expenditure during the year? (a) 12,000 shares (b) 18,000 shares (c) 20,000 shares (d) 24,000 shares (e) 30,000 shares. 2. B All the participants in the call money market are split into two categories. The first comprises the entities who can borrow as well as lend in the market and the second comprises only lenders i.e. the participants in the second category cannot borrow in the call money market. RBI, DFHI, STCIL and commercial banks belong to the first category and all the financial institutions and mutual funds belong to the second. Hence, (b) cannot borrow in the call money market. 3. E An optimal capital structure can satisfy the return expectations of the stakeholders at a lower cost that will result in share price of the company to a healthier one. It is a financing decision. While the cases mentioned in the other alternatives are the investment decisions as these may bring return to the company over a period of time. Hence (e) is the answer. 4. C Certificate of deposit (CD) is a financial instrument where an investor has to invest a certain sum to get a fixed amount (principal and accrued interest) on maturity at the contracted rate. So it is similar to a time deposit. CDs are transferable simply by endorsement and delivery by the holder without any restriction, whereas its maturity period ranges from 15 days to one year. But as it is a liability to the issuing banks, CDs are also subjected to the reserve requirements of the bank. Hence (c) is not a feature of CDs. 5. C Bulldog bonds are sterling denominated foreign bonds, which are raised in the United Kingdom domestic securities market. Hence option (c) is the correct choice. Samurai bonds are bonds issued by non-Japanese borrowers in the domestic Japanese markets. Yankee bonds are US dollar denominated bonds issued by foreign borrowers in the US domestic markets. Shibosai Bonds are Yen denominated privately placed bonds issued in the Japanese Markets. Matador bonds are foreign bonds issued in Spain. 6. B Medium-Term Notes (MTNs) are defined as sequentially issued fixed-interest securities which have a maturity of over one year. It enables an issuer to issue Euronotes for different maturities, from one year up to the desired level of maturity. Hence (b) is the correct choice. Commercial Papers are short-term, unsecured promissory notes issued by well known companies that are financially strong and carry a high credit rating. American Depository Receipts (ADRs) are dollar denominated negotiable certificates and they represent a non-US company’s publicly traded equity. Treasury Bills are short-term instruments issued by the government. Global depository receipts are negotiable instruments which represents publicly traded local currency equity share. Hence, options (a), (c), (d) and (e) are false. 7. D In the call money market day-to-day surplus funds of banks are traded. The call loans are of very short term in nature and any amount of money can be lent or borrowed at a convenient interest rate, which is acceptable to both the lender and the borrower and there is no maximum ceiling on the interest rate. Hence, in the given case, though the amount is huge, the interest is decided by the lender and the borrower and RBI has no role in the interest determination. The correct answer is (d). approved credit rating agencies. iv. Board resolution authorizing the issue is required. Of the above, in the given case, the company has not met (ii) and (iii). Hence, it cannot issue commercial paper of any amount. Hence, (a), (b) and (c) are not correct. (d) is also not correct because the condition (ii) will be met but the condition (iii) will not be met. 9. A If the delivery takes place on second business day after the agreement or transaction takes place it is called ‘spot market’. If the delivery date is next working day it is called ‘TOM market’. If the agreement to buy & sell is agreed upon and executed on same day it is called Ready market (transaction) or cash transaction. If the delivery takes place at a specified future date it is referred as forward market. The duration of the same varies Hence the answer is (a). respective corporate requirements Payment of a large amount of advance taxes by the banks and FIs will lead to the reduction in liquidity in the system thereby increases the volatility in the call money market. Hence, option (d) is the answer. = 1025.1 or r = ( 1025.1 – 1)2 = 0.10 i.e. 10%. 13. C PV of cash inflows in case of scheme A = (Rs. 2.5 lakh - Rs. 2.5 lakh * 10%) = Rs. 2.25 lakh PV of cash inflows in case of scheme B = 18,000 + PVIFA(k,60) *4,100 (Where, k = (1.09)1/12 – 1 = 0.0072 i.e., 0.72%) = 18,000 + 48.581*4,100 = 18,000 + Rs. 19,9182.10 = Rs. 2,17,182.10 Hence, option (c) is the answer. 1, 50, 000 PVIFA(r,6y) = 4.333 PVIFA(10%,6y) = 4.355 In PVIFA table, value of 4.333 for 6 years is found nearer at 10% column. So, the effective rate of interest is 10% approximately. m mk k P= ∑ =8.75 10.6875 Aβ =. Hence, option (b) is the correct choice. Risk premium = 0.884 (8.75 – 6) = 2.43%. 16. C Capital recovery factor is the inverse of the PVIFA factor. It can be applied to find out the amount that can be withdrawn periodically for a certain length of time, if a given amount is invested today. Hence statement III is true and the answer is (c). 2000 FVIFA (r,8) = 21,274 FVIFAr,8 = 10.637 At r = 8%, L. H. S. = 10.637 Hence, r = 8%. 18. C The amount of risk reduction depends on the degree of correlation between the stocks. The portfolio risk will be minimum if the stocks are perfectly negatively correlated. Hence, statement III is correct. Lower the degree of positive correlation, greater is the amount of risk reduction that is possible. Hence, statement II is incorrect. Statement I is incorrect as the diversifying effect of each additional stock diminishes with increase in number of stocks. Hence, (c) is the answer. 19. C Standard deviation, a measure of dispersion around the expected (or average), is the square root of the variance of the rates of return. If the variance is higher, the standard deviation will also be higher. Hence, III is true and the answer is (c). Range is referred as the difference between the highest and lowest values. Standard deviation may be the highest, irrespective of the range being the lowest or highest. Hence, I is not true. Highest mean does not mean that it should have highest standard deviation. Hence, II is also not true. The CRL is plotted by plotting Kj along the Y-axis and Km along X-axis. − Therefore the increase in the price of the security = 71.33 – 50 = Rs.21.33. 23. D Ri = Rf+β (Rm-Rf) Ri. = 6 + 0.6(14 – 6) = 10.8% As the required return from the stock is lower than the actual return produced by the stock, the stock is undervalued, will fall above the SML and will have positive alpha. Hence the stock can be purchased and the answer is (d). New required rate of return = 6 + 1.6(14 – 6) = 18.8%. 25. B The required return will increase for both stocks but the increase will be greater for Stock B than for Stock A.    − × = − × =      . Therefore, option (b) is the correct answer. 27. B According to CAPM, required rate of return = Rf + β (Rm – Rf) Where Rf is the risk-free rate of return, β is the Beta of the stock and Rm is the market return. If Beta is equal to zero, required rate of return is equal to risk-free rate of return. Hence, (II) is true. In the SML equation, slope is measured by Rm – Rf and the Beta of the stock is not relevant to find the slope of SML. Hence, (I) is not true. A stock whether it will lie below or above the SML depends on whether the stock’s required rate is more than or less than the expected rate of return. It is immaterial whether the Beta is equal to zero or not. Hence, (III) is not true and the answer is (b). 28. E If the level of output is greater than the overall break-even point, then the DTL will be positive. DTL decreases as Q increases and reaches a limit of 1. Hence, (e) is not correct and the rest are correct. 29. E DOL determines the change in the EBIT with change in sales. It is determined by the level of fixed costs. where F represents the fixed costs of the firm S represents the selling price per unit. V is the variable cost per unit. denominator, hence it will increase the quantity produced at operating break-even point. Hence, II is correct and III is not correct. Other things remaining the same, increase in the selling price per unit will increase the denominator, hence it will decrease the quantity produced at operating break-even point. Hence, I is correct and the answer is (d). 1.14S – 4.575 = 0.6S – 1.433 0.54S = 3.142 S = Rs.5.82 crores. 34. C EPS, DPS and required rate of return being the same, low dividend yield and high P/E ratio implies that there is considerable growth prospects in Vipul. Hence, II is correct. As the growth rate increases, the expected return depends more on the capital gains yield and less on the dividend yield. Hence, III is correct. As growth prospects are higher the price of Vipul should be higher. Hence, I is not correct and the answer is (c). 35. D Treasury bills are also referred to as gilt securities. PSU bonds are the securities issued by the public sector entities. Hence, I is not true. 91 days Treasury bills are issued by auctions conducted by RBI. Hence, II is true. RBI neither rediscounts nor participates in auctions of these T-Bills. Hence, III is also true and the answer is (d). 36. A For zero-coupon bonds, duration will be the maturity. Longer the term to maturity, higher will be the price change. Of the 20-year zero coupon bond and 10-year zero coupon bond, price change is higher in case of 20 year bond. Smaller the coupon rates, higher is the price change with a change in YTM. Hence, of (a), (c) and (d), the change in price is higher in case of (a). 37. E Dividend yield is the dividend per share divided by market price per share. It can also be calculated as dividend pay out ratio divided by P/E ratio. A company must be liquid and profitable to pay consistent and adequate dividends. Hence, II is correct and I and III are not true. 2, 500 1.115 = Rs.1,450.60 = Rs.1,451. 39. C ke = Re+ βj(Rm-Rf) Old ke = 0.10 + βj (0.142 - 0.10) = 0.10 + 0.042βj P = Rs.0.68(1.07)/(0.10 + 0.042βj - 0.07) = Rs.11.44 βj = 0.80 New ke = 0.10 + 0.8(1.4)(0.142-0.1) =0 .147 P =Rs. 0.68(1.07)/(0.147 - 0.07) = Rs.9.45 A decrease of Rs. (11.44-9.45) = Rs.1.99 a share. 40. C According to the bond value theorems, price of the security and the yield to maturity are inversely related. As YTM increases, other things remaining constant, the value of the bond decreases. Hence, in the given question the value of bond B will be greater than the value of bond A which is greater than the value of bond C. Hence, the answer is (c). From the above equation, we can conclude that increase in the expected dividend payout ratio and increase in the growth rate will lead to increase in Expected Price-earning ratio. Hence statements I and III are correct. Therefore, option (d) is the answer. Increase in the cost of capital will decrease the Expected Price-earning ratio. Hence, (II) is incorrect. 42. B In the intrinsic value formula the face value of the bond is multiplied with the factor PVIF(r,n). The factor PVIF(r,n) decreases as the number of years to maturity increases, other things remaining the same. Hence, other things remaining the same, the present value of the face value of the bond decreases as the number of years to maturity increases. Therefore alternative (b) is not true. All other alternatives are true. 43. A There is no pre-specified maturity period in the multi-period valuation model of equity shares; cash flows over an infinite duration are considered. 44. D The conversion value represents the market value of the convertible if it were converted into stock. This is the minimum value of the convertible based on the current price of the issuer’s stock. Hence, I is true. Conversion premium is the difference between the conversion price and the conversion value. Hence, III is also true and the answer is (d). Whether it is optionally convertible debenture or compulsorily convertible debenture, whether it is fully convertible or partially convertible debenture, on conversion cash is not involved. It is merely, the old security is exchanged for the appropriate number of new securities is issued in turn. Hence, II is incorrect. 45. C When the market is low, public issue and rights issue may not be successful. Of the given methods of private placement and bought out deal should be preferred. Of the two, bought out deal is the most preferred because the sponsor or the merchant banker who is involved in the deal takes up the issue with an intention of offloading to the public at a later stage when the market picks up. 46. C Custodians hold the underlying shares and collect rupee dividends on the underlying shares and repatriate the same to the depository in US dollars/foreign equity. Hence (c) is the answer. Lead managers undertake activities like preparation of offer circular, marketing the issues etc. Underwriters of the issue bear interest rate or market risks moving against the issuer before they have placed bonds or depository receipts. 47. A SPN is a kind of non-convertible debenture with an attached warrant. It is neither a convertible or partly convertible debenture nor any option can be attached to it. The warrants attached to the SPN does not gives holders the right for the preference shares. It is also not an example of participating preference shares. Therefore only option (a) is correct. Rest are incorrect. 48. D Preference shareholders have preference over equity shareholders on the post tax earnings of the firm. Preference dividends are not tax deductible. Voting rights can not be given to the cumulative preference shares. Preference shares (except participating preference shares) do not participate in the surplus. Preference shares can be redeemable or irredeemable. Perpetual preference share capital will remain with the company forever. Thus only option (d) is correct. Rest are incorrect. or S = 54 (6) – 56 (5) or S = Rs. 44 per share. 50. C The debt capital is the cheapest source of financing but it should be used within reasonable limits. 51. D Agency cost are cost on account of restriction imposed by creditors on the firm in the form of some protective covenants. Commission payable by the company to its purchasing and selling agents, the expenses incurred in distribution of the products of the company, or the dividends paid by the company does not come under the agency cost. 52. E In the realized yield approach one of the implicit assumptions is that the equity shareholders will continue to expect the same returns from the share as in the past. Hence option (e) is the correct answer. 53. C The cost of raising fresh equity involve the flotation cost which increases its cost more than the cost of retained earnings. So it is not equal to the existing cost of retained earnings. It is not free of cost, and it does not depends on the earning per share of the company. Hence (c) is the correct answer. So option (d) is the answer. 58. A As per the MM Hypothesis, the value of levered firm exceeds the unlevered firm by the amount of tax shield. = 30,00,000 × 0.50 = Rs.15,00,000. Cost of equity = 10.122/20=0.5061=50.61%. 60. E The bond yield plus risk premium approach is used to find out the cost of equity capital. It is illogical to apply for finding out the cost of bonds because the basis of this approach is the yield or cost of the bond itself. The cost of preference capital is found out by discounting the preference dividends and redemption value, and the cost of term loan is found out by adjusting the nominal interest cost for tax. Generally there are no explicit costs associated with trade credit and there is no logical connection between the cost of trade credit and bond yields. 61. C The book values of the different sources of finances may not be related to their current economic values e.g. the land price may appreciate, the machine may become obsolete, etc. The reasons stated in the other options are the advantages of using book values as the basis of the weights for the calculation of the cost of capital. 64. B Agency costs (not bankruptcy costs) represent certain restrictions on the firm in the form of some prospective covenants incorporated in the loan contract. Statement (I) is wrong. The probability of bankruptcy for a levered firm is higher than for an unlevered firm. Beyond a threshold level, the probability of bankruptcy increases at an increasing rate as the debt-equity ratio increases. This means that the expected cost of bankruptcy increases when the debt-equity ratio increases. Investors expect a higher rate of return from a firm, which is faced with the prospect of bankruptcy, as bankruptcy costs represent a loss, which cannot be easily diversified away. Therefore statement (III) is true, and statements (I), (II) and (IV) are wrong. Hence (b) is the correct answer. 65. D Cost of external equity comes into picture, when there are certain floatation costs involved in the process of raising equity from the market. 66. E All the given statements are limitations of Walter’s model. 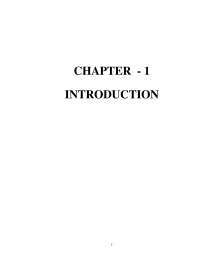 = Rs.100 Hence, the required market value of the share as per Walter’s model will be = Rs.100. rational. In perfect market condition there is easy access to information and the flotation and the transaction costs do not exist. The securities are infinitely divisible and hence no single investors in large enough to influence the share value. • Secondly, it is assumed that there are no taxes, implying that there is no differential tax rate for the dividend income and the capital gains. • The third assumption is a constant investment policy of the firm, which will not change the risk complexion nor the rate of return even in cases where the investments are funded by the retained earnings. Finally, it was also assumed that the investors are able to forecast the future earnings, the dividend and the share value of the firm with certainty. This assumptions was however, dropped out of the model. The company has to issue 30,000 new shares. = 5.45 = 10.9% (approximately) Hence, the answer is (b).